If you don't know the films of Aki Kaurismäki then you could be in for a treat. The slight caution in my wording stems from the knowledge that his distinctive style certainly doesn't work for everyone, although I've yet to meet someone whose views I respect who doesn't delight in his singular pairing of misery and deadpan hilarity. Maybe it's just us. Certainly the audience for his films has remained closer to cult than mainstream, even in his own country. In an interview on Artificial Eye's DVD of his latest, Lights in the Dusk, actress Maria Järvenhelmi suggests that Finns themselves don't go and see his films in large numbers because Kaurismäki gets a uncomfortably close to the truth about Finnish society and attitudes. I can't personally vouch for this, but have two Finnish friends who are jollier than anyone you'll encounter in Kaurismäki's film world and who adore the director's work, and they cheerfully testify to its accurate reflection of both Finnish life and humour. The three films included here have been alternately referred to, depending on the source, as The Underdog Trilogy and The Workers Trilogy. Both titles are certainly appropriate, although the first of these is a little imprecise, linking the titles with a trait that is common to just about every lead character in Kaurismäki's oeuvre. There's certainly the stamp of the latter on the opening sequences of all three films, which introduce us to the central character in their place of work, focussing on the daily routine of rubbish collector Nikander in Shadows in Paradise and on the machinery that shapes and wraps the product for Iris's inspection in The Match Factory Girl, while the social commentary of Ariel is established up front with Taisto helping to seal from the mine that he and his colleagues have just been laid off from. 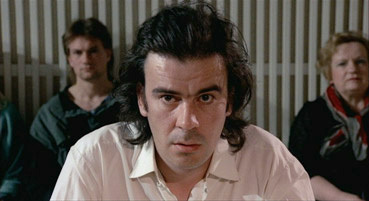 All three films are clearly the work of the same director, sharing his economically minimalist approach to storytelling, his canny mix of traditional, blues and rock 'n' roll tunes to both augment and counterpoint the mood of a scene, his blend of observationally static shots with gentle dolly work, the contribution of location and set dressing to the mise-en-scène, and the way the gloom of the characters does not downcast the film itself. The tone of the three films may be similar, but the emphasis is different in each, the deadpan comic exchanges in Shadows in Paradise more poignantly undercut with the drama in Ariel, while The Match Factory Girl paints its comedy so dark that you be forgiven for missing it. What does unite the films and the characters is that they are instantly and uniquely fascinating in a manner that defies easy explanation. Certainly for someone who has grown increasingly tired of being treated like a four-year-old by mainstream cinema, which tends to loudly justify even the blatantly obvious and handles emotional relationships as if following strictly enforced stylistic guidelines, Kaurismäki's imaginatively constructed and witty minimalism is a constant delight. In common with Japanese actor/director Kitano Takeshi, he can tell ten minutes of story with a single economical shot or a perfectly timed edit, compressing a feature-length narrative into little more than an hour. And there won't be a wasted moment in it. Shadows in Paradise [Varjoja paratiisissa] was Kaurismäki's second feature, but even if the only film of his you've seen is the recent Lights in the Dusk, you'll instantly recognise this as his work. The critical will find ammunition in this and suggest that he has failed to progress or expand his horizons. Of course you could also say that of Hitchcock and Ozu – indeed it has been repeatedly claimed that the latter spent his career essentially remaking the same film, but this is never intended as a criticism. Ozu's films are often strikingly similar to each other, but no-one else made films quite like Ozu, and there's certainly no-one making them quite like Kaurismäki. The first half of this story's glum couple is garbage man Nikander, whose regular co-worker tells him of his plans to start his own refuse collection company – the bank is behind him, he even has a location sorted, and he wants Nikander to come on board as his foreman. It's a definite step up for Nikander and his otherwise solitary and humdrum life, but wouldn't you know it (this is a Kaurismäki film, after all), these best laid plans die with their originator when he collapses on the job with a heart attack. His dreams having been dashed, Nikander recruits a new workmate, while two chance encounters land him a date with unhappy supermarket cashier Ilona. It doesn't go well – he takes her to a bingo hall – and she suggests a parting of the ways. When she is laid off from her job, however, she steals the firm's cash box and convinces the bemused Nikander to drive her out of town. Shadows in Paradise is both an oddball love story and an offbeat noir heist movie, complete with a revenge robbery, a couple on the run and a moody femme fatale. Only here the robbery nets little, the couple are don't go far, and although definitely moody, there's nothing all that fatale about our femme Ilona. Kaurismäki's ace in the hole here is actress Kati Outinen, whose natural expression appears to be one of misery bordering on tearful breakdown, a physical representation of the director's trademark deadpan gloom. She's matched all the way by Matti Pelonpää's deflated optimism as Nikander, a man resigned to any fate that's handed out to him but who still carries a small flame of hope for better things. 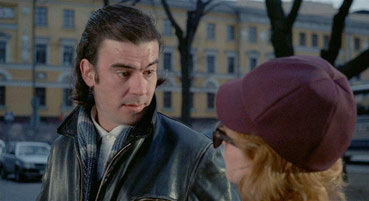 Little wonder that both actors became Kaurismäki regulars – Outinen was to appear in a further nine films for the director (her role in the recent Lights in the Dusk was effectively a cameo, but it still counts), while Pelonpää was to feature in another eight, plus two for the director's brother Mika. Kaurismäki's distinctive style is on every frame of the film, including his straight-faced humour, often in stripped-down, functional exchanges that in mainstream western movies would be emotional flashpoints. My favourite comes when Nikander's co-worker outlines his plans for the new company: "I've got a slogan already," he tells Nikander with as much enthusiasm as he is prepared to muster. "'Reliable garbage disposal since 1986'." "But that's now," Nikander points out, which prompts the response, "That's why it catches the eye." Kaurismäki's fifth feature is, despite some delightfully deadpan comedy exchanges, one of his bleaker films, a downbeat drama of misfortune built on a foundation of social commentary, particularly regarding the changing employment prospects in Finland in the late 1980s. This is signalled from the opening scene, when a mine closure scatters the redundant workforce to search for employment wherever they can find it. One of them, Taisto, is given a Cadillac convertible by a colleague, and after withdrawing his life savings, he too joins the work-hunt exodus. This being a Kaurismäki film we don't expect things to go that well, and it's no real surprise when Taisto is knocked unconscious and robbed of his cash at the first place he stops. When Taisto reaches the city he joins other desperate hopefuls for a day's work at the docks, which pays enough for a bed at the local mission hostel. A chance encounter hooks him up with single mother Irmeli, who has to work long hours in three different jobs to pay the bills. Taisto's own search for regular work proves fruitless, and when he loses his hostel bed he is forced to sell his car, his only possession of worth. Chance again plays a hand when he spots one of the men who robbed him – he avoids the man's knife, but his attempt to retrieve his stolen money is interrupted when he is overpowered and arrested by police, who have mistaken him for the mugger. Prosecuted for the crime, he is sent to jail for two years. Irmeli: Thanks for the evening. My first in a convertible. Taisto: The roof doesn't work. Irmeli: I know. It's dark. Want to come up? Taisto: If it's not too much trouble. Irmeli: I've only got coffee. Taisto: Don't let it get you down. Irmeli: I've got a kid, too. Taisto: Even better. We save time raising a family. Irmeli: You always this self-confident? Taisto: This is the first time. Taisto's jail time has its own pleasures when his cell mate Mikkonen turns out to be none other than Kaurismäki favourite Matti Pellonpää, the friendship that develops between the two giving the second half its structure and the finale part of its emotional sting. The characters drive the plot and there are no pauses for portraits of Finnish prison life – others briefly enter the story only to move Taisto, Mikkonen and Irmeli towards the final act. Despite boasting a level a humour you'll not find in The Match Factory Girl, Ariel is definitely the most emotionally affecting of the Underdog/Worker Trilogy. There's an overriding reality here that ensures the mechanics of fate that keep this oddly likeable family unit from coming together really do hit home. As with The Match Factory Girl, it's the self-interest of others that does the most harm, but here it is balanced by Irmeli and Mikkonen's unwavering loyalty and Taisto's determination to do right by both. The destructive wild card is the system itself, indifferent to the truth or the fate of those who fall victim to its failings. It leads to an ending that is at the same time both hopeful and sad (and set beguilingly to a Finnish rendition of Somewhere Over the Rainbow), a final comment by Kaurismäki on his own society, and the point you'll have to reach to discover the significance of the title. I'm not going to sit on the fence here – as far as I'm concerned, The Match Factory Girl [Tulitikkutehtaan tyttö], Aki Kaurismäki's sixth theatrical feature, is a minimalist gem of a film, a simple story of a dour young woman and the action she eventually takes to balance her reckoning with her own unfortunate life and the self-centred behaviour of others. Fascinating in the way Kaurismäki's films and characters just seem to be, it's in the final fifteen minutes that it hits its home run, a consolidating and darkly satisfying story climax on which an entire essay could be written, but which I cannot discuss here without ruining it's delicious sting for first-timers. Any reviewer who does so should be hunted out and heartily slapped for their insensitivity. 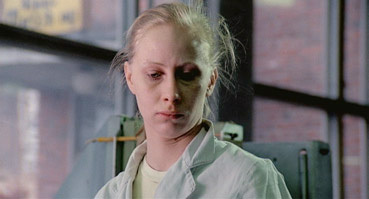 Kati Outinen again lends her extraordinary facial unhappiness to the role of Iris, the match factory girl of the title. A silent and efficient worker, she hands most of her wages over to her equally cheerless mother and stepfather, whom she lives with and keeps house for. Her search for companionship is not going well, but a change of image attracts the attentions of Aame, whom she spends the night with. Hopes of a developing romance are soon dashed by Aame's indifference to her attentions and annoyance at her persistence, but the discovery that she is pregnant proves a turning point for her and her relationship with those around her. Kaurismäki's specific brand of minimalism is extended here to a pared-to-the-bone approach to dialogue, which very effectively emphasises Iris's isolation and loneliness. We're 23 minutes in before she speaks to anyone, while her fractured relationship with her parents is highlighted by the first on-screen word spoken to her by her stepfather, who slaps her face and calls her a whore after she buys a new dress with wage money that is usually handed to them. This non-verbal approach does produce one of the few light moments, when Aame agrees to take Iris out and finds himself in the seat-grindingly uncomfortable company of her parents while she goes off to get ready for their date. It's a rare chance to smile in an otherwise downbeat but consistently involving and touching portrait of life suffocated by circumstance and punished by the self-interest of others. It's hard to imagine Iris played by anyone but Outinen, the brief moments when a smile breaks her otherwise unbroken expression of gloom betraying the hope that still flickers behind her grim façade. It's in the final scenes, those ones I prmised not talk about in detail, that this galvanises her into action. It may not be the romantic idyll she dreams of, but in the heartless world in which she finds herself, it can't help but seem both logical and perversely positive. It's here that you'll find the deadpan humour that is largely suppressed in the build-up, though rarely if ever in Kaurismäki's work will you find it painted this black. A barrel of laughs it may not be, but The Match Factory Girl tells its story with captivating cinematic economy and an affection for its forlorn central character that binds us to her from her first appearance. It's a bond not just of sympathy but empathy, a recognition of darker moments in our own lives and the cruelty we may have endured, however brief or unintended, from those we regard as close to us. Of the three films in this first set, the only one I have seen on DVD before is The Match Factory Girl, a Finnish disc whose transfer quality I was impressed with. It would appear that Artificial Eye have sourced their disc from the same original, as the anamorphic 1.85:1 picture here is a dead ringer for the one on the Finnish DVD, and that's fine by me. The other two films are similarly well presented – the colour has an occasional and probably intentional pastel bias, while contrast and black levels are bang on. Film grain is sometimes visible and the occasional bit of dust remains, but the level of detail is often first rate. There is some slight flickering in a couple of scenes and digital purists may be a bit miffed to see reel change markers still present, but otherwise I have no complaints. All three films have Dolby stereo 2.0 tracks and they are some of the best I've heard in a long while, vividly clear mixes with strikingly full sound and tonal range. Frontal separation is precise and well used. None. A bit of a shame, as a bit of background on each of the films would have been nice, ideally from Kaurismäki himself, but as far as I remember the Finnish discs were also film-only affairs. A pity about the lack of extra features, but it really doesn't matter. You still get three terrific films from one of world cinema's most distinctive talents, all boasting fine transfers and soundtracks. The first of four such collections from Artificial Eye, collectively they should represent a long overdue and most welcome treat. Warmly recommended.